1 What is Robots.txt used for? The file uses the Robots Exclusion Standard, which is a protocol with a small set of commands that can be used to indicate access to your site by section and by specific kinds of web crawlers (such as mobile crawlers vs desktop crawlers). 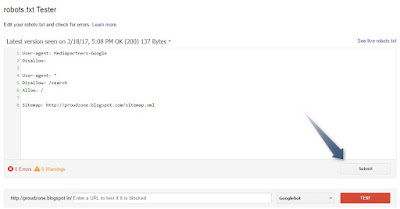 In simples sense, robots.txt file helps a site to crawl or block its URL’s. So, it’s a pros to have a robots.txt file in an individual site. For non-image files (that is, web pages) robots.txt should only be used to control crawling traffic, typically because you don’t want your server to be overwhelmed by Google’s crawler or to waste crawl budget crawling unimportant or similar pages on your site. 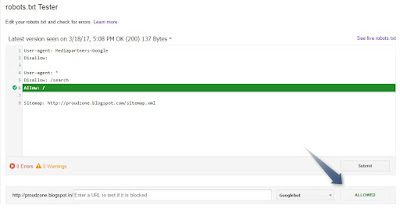 Before you build your robots.txt, you should know the risks of this URL blocking method. At times, you might want to consider other mechanisms to ensure your URLs are not findable on the web. The instructions in robots.txt files cannot enforce crawler behavior to your site; instead, these instructions act as directives to the crawlers accessing your site. While Googlebot and other respectable web crawlers obey the instructions in a robots.txt file, other crawlers might not. Therefore, if you want to keep information secure from web crawlers, it’s better to use other blocking methods, such as password-protecting private files on your server. Although respectable web crawlers follow the directives in a robots.txt file, each crawler might interpret the directives differently. You should know the proper syntax for addressing different web crawlers as some might not understand certain instructions. 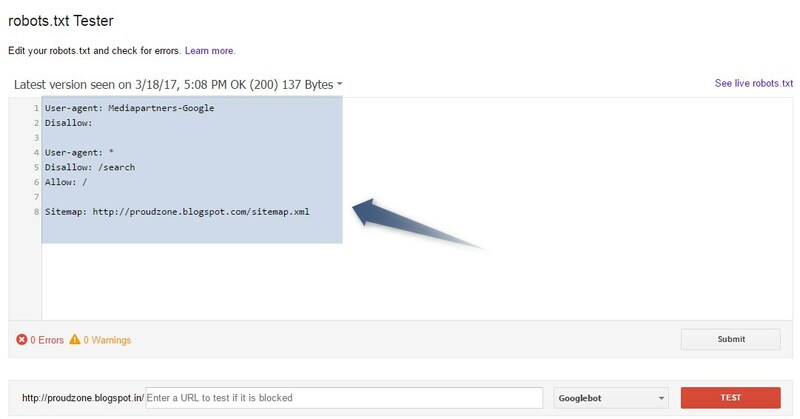 While Google won’t crawl or index the content blocked by robots.txt, we might still find and index a disallowed URL from other places on the web. As a result, the URL address and, potentially, other publicly available information such as anchor text in links to the site can still appear in Google search results. 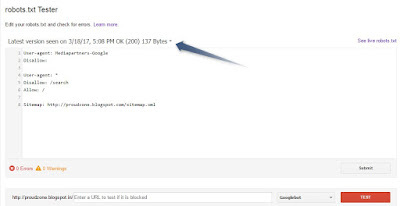 You can stop your URL from appearing in Google Search results completely by using other URL blocking methods, such as password-protecting the files on your server or using the no index meta tag or response header. In order to make a robots.txt file, you need access to the root of your domain. If you’re unsure about how to access the root, you can contact your web hosting service provider. Also, if you know you can’t access to the root of the domain, you can use alternative blocking methods, such as password-protecting the files on your server and inserting meta tags into your HTML. You can make or edit an existing robots.txt file using the robots.txt Tester tool. This allows you to test your changes as you adjust your robots.txt. 1. Select the user-agent you want to simulate in the drop-down list to the right of the text box. 2. Click the TEST button to test access. 3. Check to see if TEST button now reads ACCEPTED or BLOCKED to find out if the URL you entered is blocked from Google web crawlers. 4. Edit the file on the page and retest as necessary. Note that changes made in the page are not saved to your site! See the next step. 5. Copy your changes to your robots.txt file on your site. This tool does not make changes to the actual file on your site, it only tests against the copy hosted in the tool. The Submit function of the robots.txt Tester tool allows you to easily put in place and ask Google to more quickly crawl and index a new robots.txt file for your site. 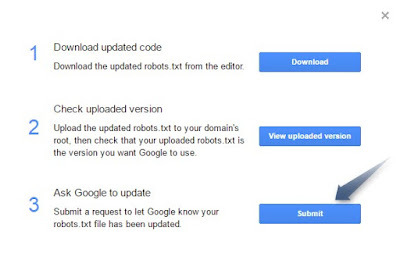 Update and notify Google of changes to your robots.txt file by following the steps below. 1. 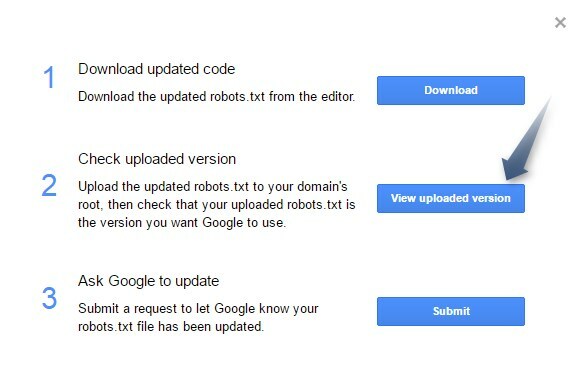 Click Submit in the bottom-right corner of the robots.txt editor. This action opens up a Submit dialog. 2. Download your edited robots.txt code from the robots.txt Tester page by clicking Download in the Submit dialog. 3. 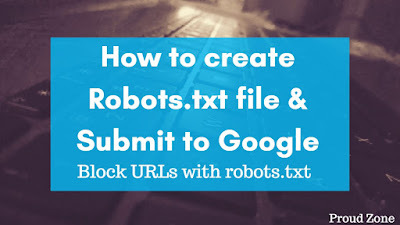 Upload your new robots.txt file to the root of your domain as a text file named robots.txt (the URL for your robots.txt file should be /robots.txt). If you do not have permission to upload files to the root of your domain, you should contact your domain manager to make changes. For example, if your site home page resides under subdomain.example.com/site/example/, you likely cannot update the robots file subdomain.example.com/robots.txt. In this case, you should contact the owner of example.com/ to make any necessary changes to the robots.txt file. 4. Click Verify live version to see that your live robots.txt is the version that you want Google to crawl. 5. Click Submit live version to notify Google that changes have been made to your robots.txt file and request that Google crawl it. 6. Check that your newest version was successfully crawled by Google by refreshing the page in your browser to update the tool’s editor and see your live robots.txt code. After you refresh the page, you can also click the drop-down above the text editor to view the timestamp of when Google first saw the latest version of your robots.txt file. Note: Warning! Use with caution. Incorrect use of these features can result in your blog being ignored by search engines. By performing the above steps you can create a robots.txt file very easily & also you will learn how to submit it to Google. 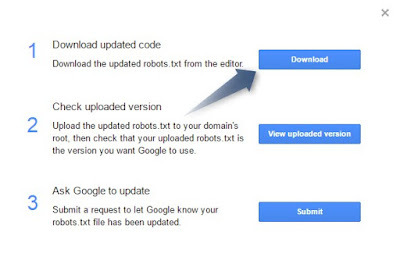 Robots.txt file plays an important role for bloggers in Search Engine Optimization. That is why A site must have a robots.txt file in order to get organic traffic from SERP’s. If you this post, please do share our post with your friends via Facebook, Twitter & Google plus. Thank you.